Trinity Candle Factory Scented - Votive Candle - 24 Pack. This Votive Candle 24 pack comes in all fragrances, premium scented for maximum fragrance throw. With a 15-20 hour burn time, cotton wick and premium scent. Fits in all candle votive holders. 100% Satisfaction Guarantee. I purchase Bayberry candles every December to give to family & friends to fulfill the Xmas Candle tradition. Burning the candle Xmas Eve and letting it burn out on it's own brings luck for the next year. These votive candles burn for hours lasting well into Xmas Day. The scent continues to fill the homes until the last drop is gone. Will continue to order every year. so far they are burning beautiful and we are very happy. Honestly, it's always nice to win a free candle, spray, etc., but I'm writing this review because the quality of these candles are excellent. I have yet to buy a candle from Trinity Candles that I didn't like. I purchase a lot of candles. They relax me. 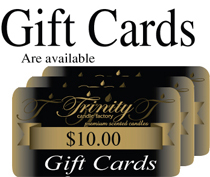 Since I found Trinity Candles, I've stopped buying candles from other candle manufactures. Give them a try. They 100% guaranteed and I promise the only problem you will have is deciding what fragrance to buy. This is my new favorite scent so far....Love it!!! By far the strongest scented votives I've ever bought! I don't bother buying the ones at the mall anymore. No comparison! Love the Patchouli! Be careful with this candle scent because you will get hooked! We are. Everyone in my little family loves it and it is now a requirement to go on living our lives as we know it. My 2 boys, husband and I all burn this candle constantly and when we don't someone says, hey! Whats missing? Something's not right in here. OH! YES! Light that candle will you? We just love it, Mom! I always get Bayberry Votives at Christmas to give all of my relatives to burn for good luck. I totally forgot about doing it this year until a few days before Christmas. I found Trinity doing a Google search. I ordered the candles, hoping that they would be there by Christmas Eve. Surprise--they were there the Thursday before Christmas--two days after I ordered them! Talk about great service. And the candles--yum!!! They burned forever and smelled so good. Getting my bayberry votives from Trinity will be my new Christmas tradition! Thanks for the great service and great product! These candles have a wonderful scent that lasts throughout the burning of the candle. They also smell good even while not burning. I was surprised to receive my shipment, including the 24 pack of these votive candles, only three days after placing my order. They arrived in perfect condition, are beautiful, and the fragrance is rich. Thank you for always providing high quality candles for my special events!